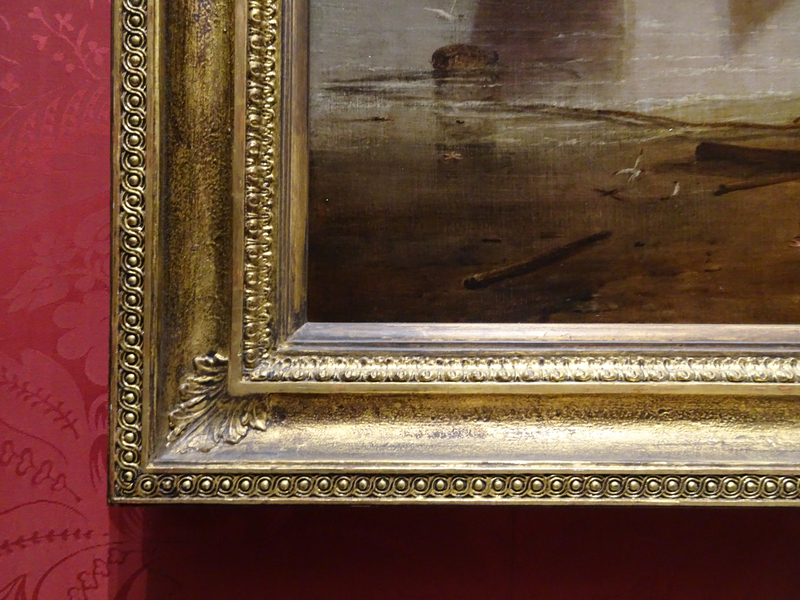 Following upon Ivan Houghton’s catalogue raisonné of frames connected with the Turner Bequest , he and Gerry Alabone have written an article updating their work on the frames associated with Turner’s paintings in the Tate and National Galleries, ‘Understanding the framing of the Turner Bequest II’ . 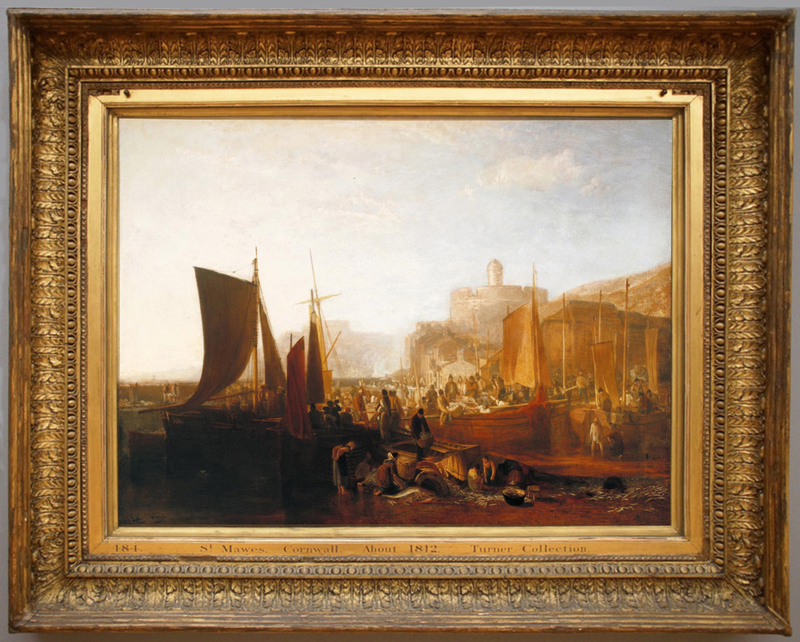 JMW Turner (1775-1851), Dido building Carthage, 1815, hanging in the National Gallery, London, with Claude Gellée, Le Lorrain (1604/5?-82), Seaport with the embarkation of the Queen of Sheba, 1648. 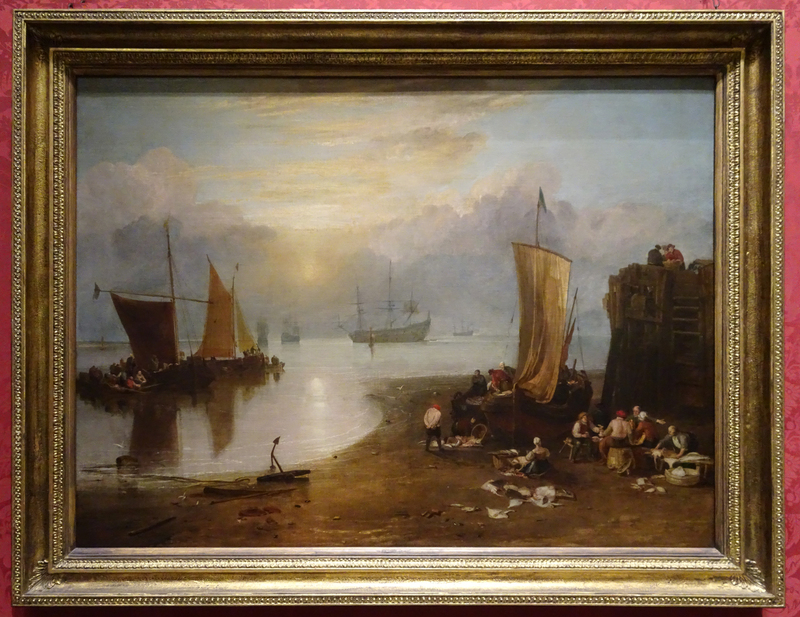 ‘Turner had left his work to the nation on his death in 1851, although the so-called Turner Bequest was delivered to the National Gallery in 1856 as a collection of unframed paintings. Jabez Tepper, the son of one of Turner’s cousins (who were contesting the will ), had to grant the Trustees of the Gallery formal permission to take ‘all or any of the Picture frames… now on the Testator’s Premises 47 Queen Anne St’ ‘. This quotation explains the subsequent confusion as to which frame belonged to what painting, with the further complication that the conditions in the Gallery – leaky and damp as they were – meant that some of the frames had deteriorated beyond practical hope of restoring them: which would in any case probably not have been seen as a priority in 1856. The new article by Ivan Houghton and Gerry Alabone deals with this resultant confusion, which has lasted ever since paintings and frames entered the national collection. It consists of an essay summing up the complexity of problems associated with the framing of the Turner Bequest, and an appendix in tabular form which itemizes the frames of the one hundred finished paintings in the Bequest by style, relationship of frame to painting, and any suggested changes to the current pairing. It is a triumph of meticulous sorting out, measuring, and assessing the age, condition, and untouched or remade condition of each frame. Dido building Carthage, above, one of the two original pillars of the Turner Bequest, is thus reported as having a ‘NeoClassical leaf-&-berry’ frame, which has been ‘made of two cut-down frames by NG’, and probably has nothing to do with Turner’s own frames at all . This is also true of the second painting, The sun rising through vapour (below). In 1968 the lion’s share of the Bequest was transferred to the Tate Gallery, with seven Turners remaining at the National Gallery, ‘to represent the full range and influence of Turner’s work’ . All these finished paintings were framed haphazardly, many in Turner’s frames, but with little regard to congruent periods and styles, and sometimes having an arbitrarily chosen but conveniently-sized frame cut to fit. 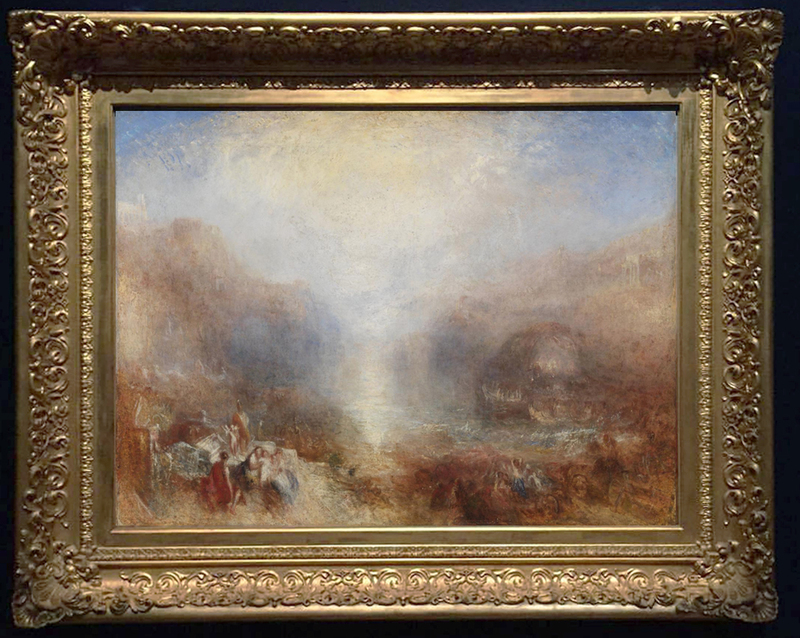 The unfinished works, which – following settlement of the case brought by Turner’s family – had also been awarded by the court to the nation, were framed by both Galleries in non-Turner frames and generally in mid-19th style . 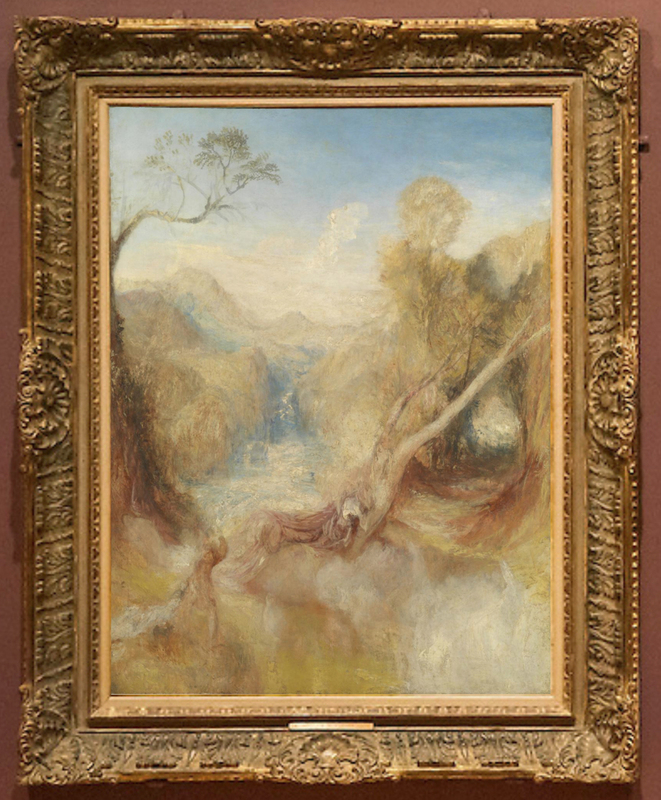 By studying the Tate and National Gallery archives for references to Turner frames, reframing, alterations to and from glazing doors, etc; examining Turner frames elsewhere; and referring to the chronology of the paintings, the authors have refined their database of frame styles, and have worked out that the 100 finished paintings of the Bequest have between them 36 surviving frames from Turner’s Gallery (some of which are not now on the works to which they originally belonged). 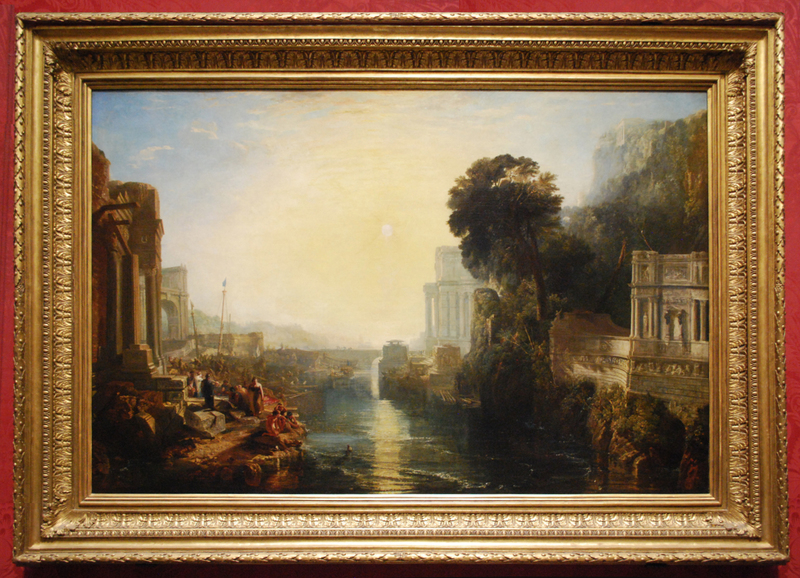 Much of the essay following on the various conclusions of the study is concerned with a group of chronologically-chosen examples, ‘illustrating Turner’s changing taste in picture frames. 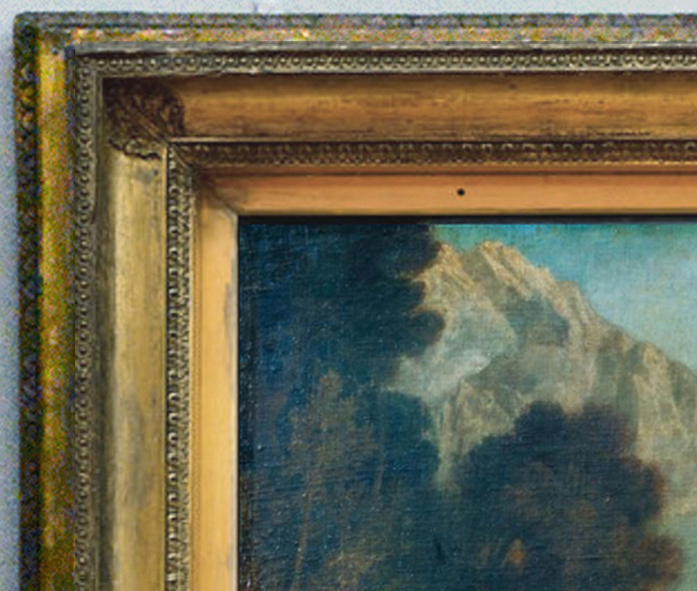 The frames are likely to be the first provided, chosen by Turner…’ . 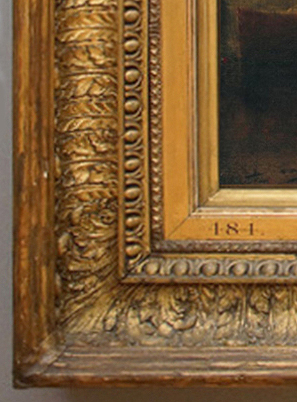 The earliest of these is a NeoClassical scotia (or hollow) frame, with a guilloche top edge, acanthus leaf corners, and rais-de-coeur above the sight edge. There are three of these, from 1797, 1806 and 1807, including The goddess of Discord… and Sun rising through vapour (above), the latter one of the two original paintings left to the National Gallery. Turner’s interest in light, and in the lighting of paintings, illustrated in the careful way he arranged the diffused lighting in his Gallery, may be related to this pattern; the use of a plain hollow to catch light and scatter it on the canvas was a functional feature in an age of candlelight. However, he evidently also discovered that a decorated hollow might provide – as well as a light-capturing resource – the animation which that light, flickering across a complex gilded surface, could add. 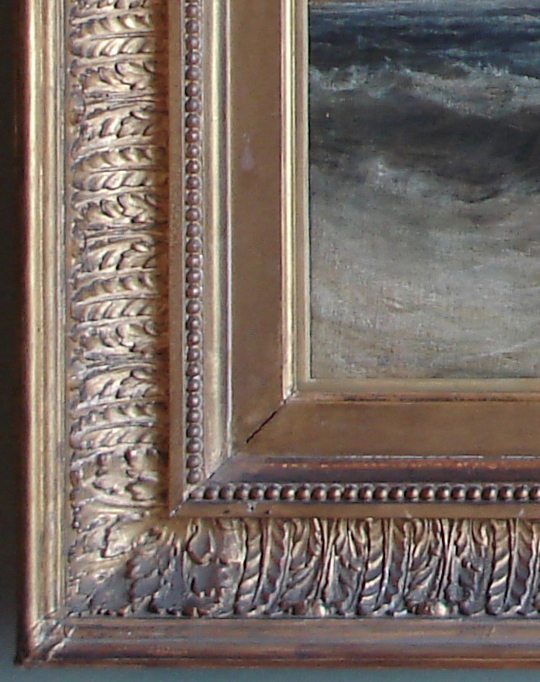 The number of frames in the Bequest with acanthus leaf ornament in the scotia comes, we are told, to 19, and there are others outside the national collection of Turners; for example, the frame on The Bridgewater Seapiece, which is a relatively early example, dating from 1801 when Turner was 26 (on loan to the National Gallery). ‘Edridge… spoke of the narrowness of Turner’s mind and said C. Long had mentioned that after the Marquiss of Stafford [sic] had pd. Him £250 guineas for “the Fishing boats” He afterwards applied several times to have 20 guineas for the frame, but it was not paid Him’ . St Mawes in the pilchard season has a variation on this acanthus scotia frame (‘one of five’, the authors note, ‘made for Turner about 1809’). The acanthus alternates with a stylized bay leaf, and the frame has fasces at the top edge and egg-&-dart at the sight edge, and has been fitted for a glazing door. A further comment adds that, ‘…it is hoped the glazing door conversion… will be reversed to move the frame closer to its condition in Turner’s time’ . 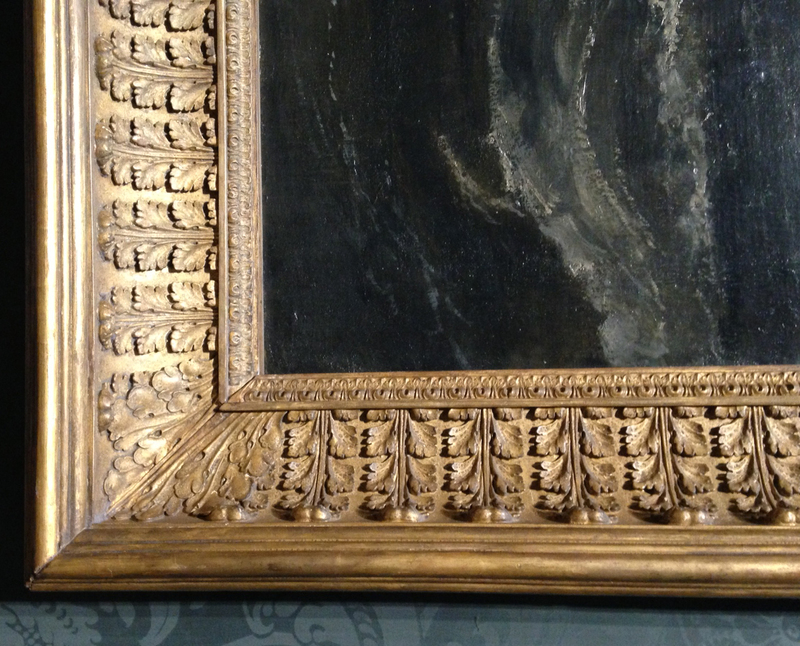 A footnote to the article connects the St Mawes… type of acanthus frame with the pair commissioned for Tabley House by Sir John Fleming Leicester, later Baron De Tabley, the painting above being still on display in the house, in its original frame. It is fascinating to examine these various examples in detail, and to note the small divergences in decoration: are these the result of employing local craftsmen? – are they due to the artist continually tweaking the design, trying to improve upon it? – are they, in fact, the client’s preference? The relative flatness of the composition acanthus ornament between St Mawes… and Tabley, windy day…, on the one hand, and The Bridgewater Seapiece (with its sculptural single acanthus leaves in deeper relief) on the other, is striking, and suggests respectively the more pragmatic, possibly less costly approach of the maturing artist as against the extravagant gesture of his younger self. Perhaps this more costly frame explains why he tried to charge it to the client, as Farington reports. 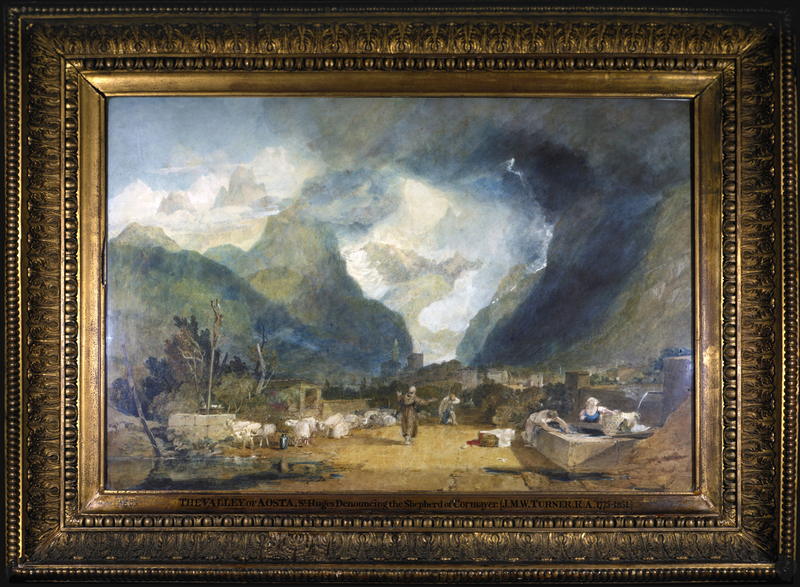 The wonderful close-framing of Turner’s watercolour in the collection of Sir John Soane is similarly sculptural, and similarly quite early – it was exhibited at the RA in 1803. 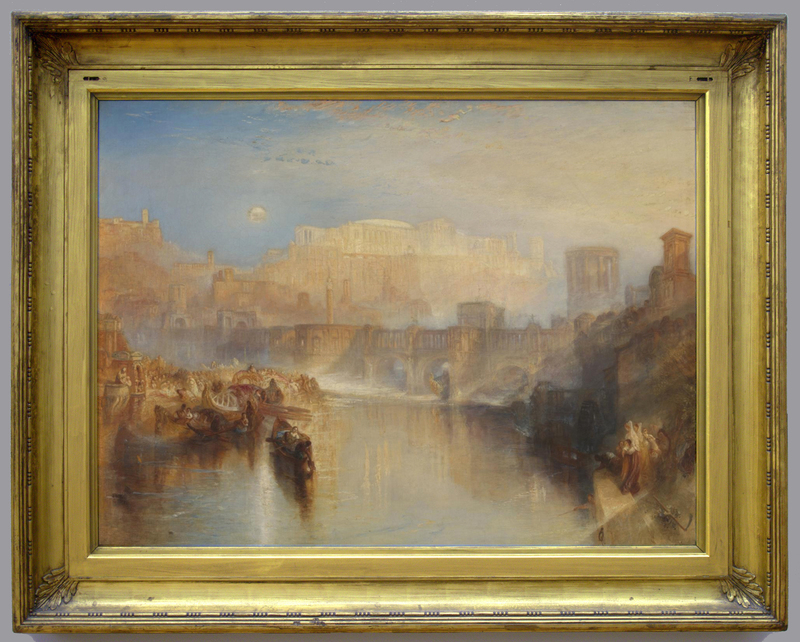 This work is on a grand scale, and its frame, with a knulled top edge, detailed acanthus leaves in the French manner and egg-&-dart, is conceived with the intention of presenting a watercolour as though it were an oil painting; it is a rare survival, and sadly there is nothing like it in the Turner Bequest. Ulysses deriding Polyphemus, in the National Gallery, has a much later version of an acanthus scotia frame, dating from 1829 ; the scotia has opened out slightly, an effect enhanced by the additional mouldings at the top edge, and the ornamental contour of an imbricated bay leaf-&-berry. This is where a NeoClassical frame drifts indefinably into the category of a NeoClassical revival, from Regency towards Victorian, from purity into greater opulence. 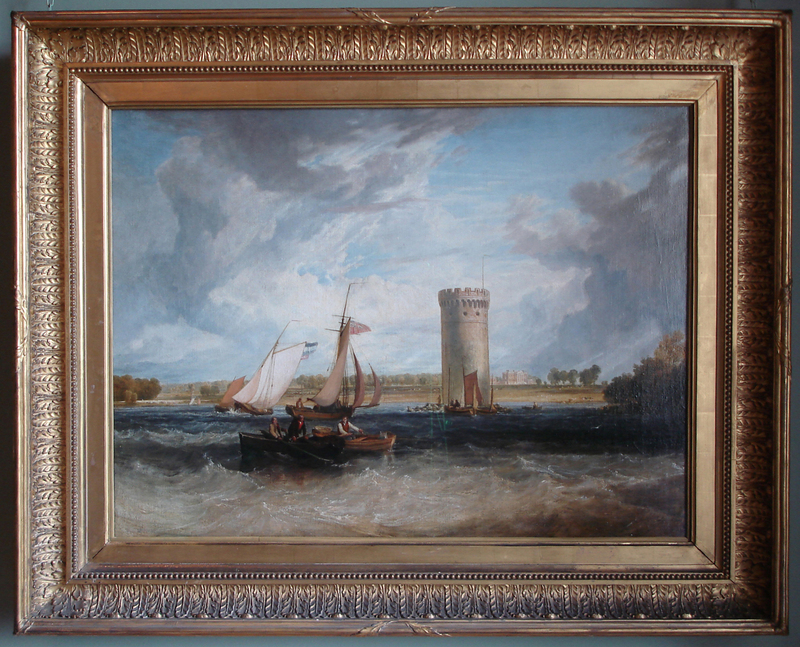 The authors’ examination of this style of frame isolates examples like this one (as almost certainly original) from those applied by the National Gallery to various of the Turner Bequest canvases when they arrived in the collection, or even later. Edward Taylor’s painting, ‘Twas a famous victory (1883, Birmingham Museums & Art Gallery), shows works from this group of eight Turners hanging in the National Gallery in their post-accession frames, with The battle of Trafalgar as the focus of the picture . One of these is The story of Apollo & Daphne, above. They also note evidence for other works in revival Rococo frames which have since been reframed: photos from 1907, 1923 and 1951 showing ‘probably [the] first frames[s]’ of The fighting Téméraire, The angel standing in the sun, and Ancient Rome: Agrippina landing with the ashes of Germanicus; thereby also revealing how relatively recently the original frames of so many paintings could be carelessly dispensed with. 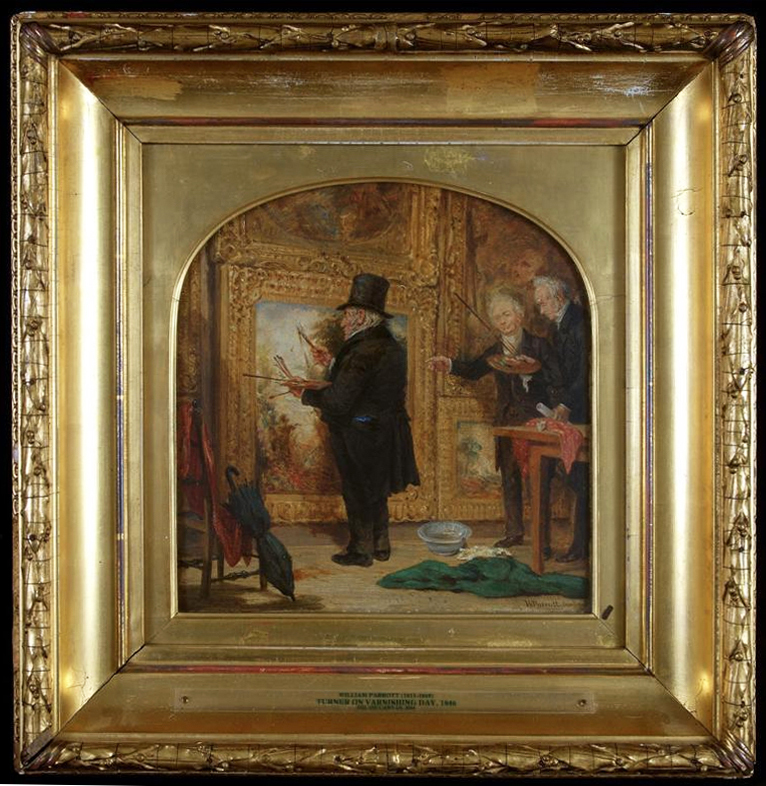 Similar evidence can be found in two late pictures of Turner working on his paintings on Varnishing Day in the Royal Academy; Fearnley’s Turner painting Regulus, 1837, and Willian Parrott’s Turner on Varnishing Day, c.1840. 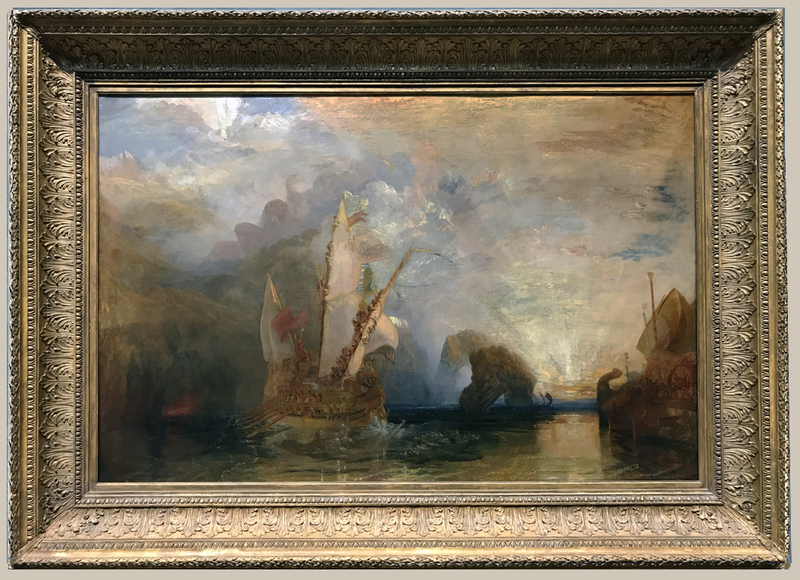 It has been suggested that Parrott’s painting depicts Turner repainting Mercury & Argus; this is currently framed in a ‘Maratta’ style, whereas the painting shows that Turner’s own choice was a heavily-ornamented straight-sided moulding frame with raking ornament on the frieze and vast scallop-shell cartouches in the corners. 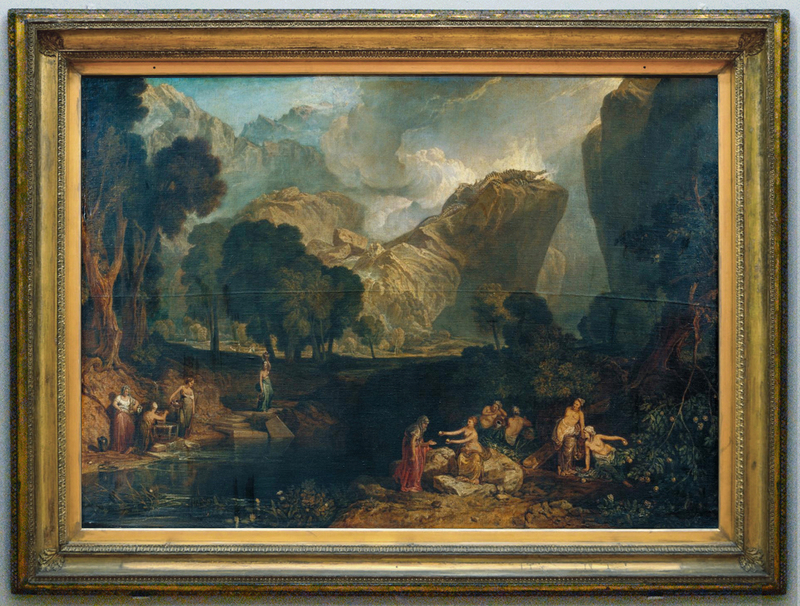 This is very similar to the frame now on The death of Actaeon…, painted near in time to Mercury & Argus, in about 1837, but which must belong to some other work in the Bequest . 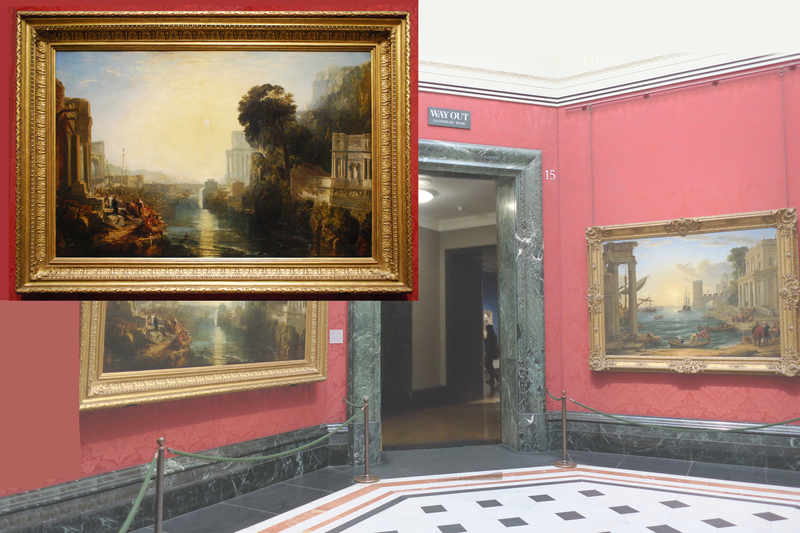 Fearnley’s Turner painting Regulus shows the latter in a swept frame with Rococo centres and corners, whereas it now hangs in a NeoClassical revival frame with an imbricated bay leaf garland on the top edge, and a wide flat frieze. Turner’s overall vision of the presentation of his paintings has been completely disrupted in the case of both Mercury & Argus and Regulus. The authors point out that this disruption may perhaps be remedied where there is enough evidence to support the making of a replica frame; for example, Modern Rome…, the pendant of Ancient Rome…, still retains its original Rococo setting, which could be reproduced for the painting in the Tate . 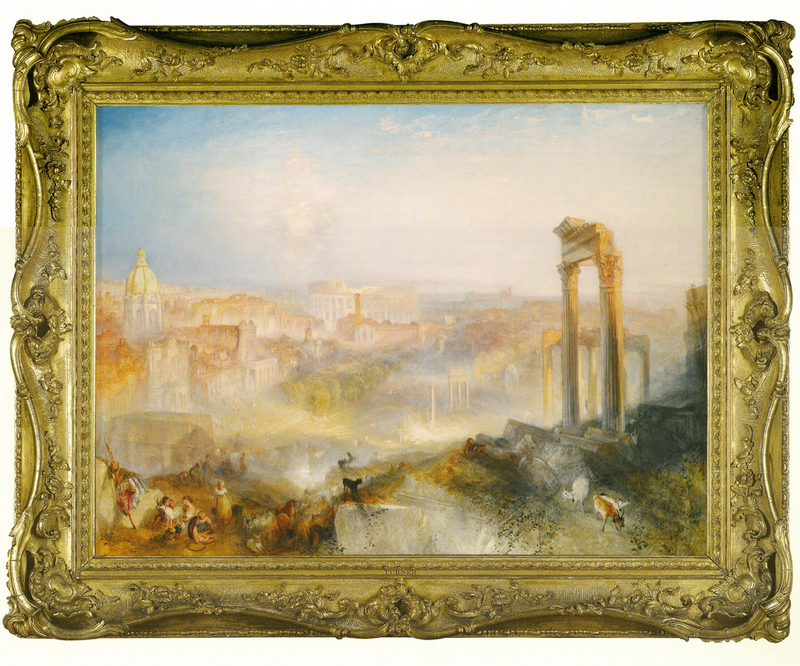 Modern Rome… has a remarkable provenance, having only been sold twice since leaving Turner’s hands, in 1878 and 2010, and the frame, like the painting, has been very well preserved. 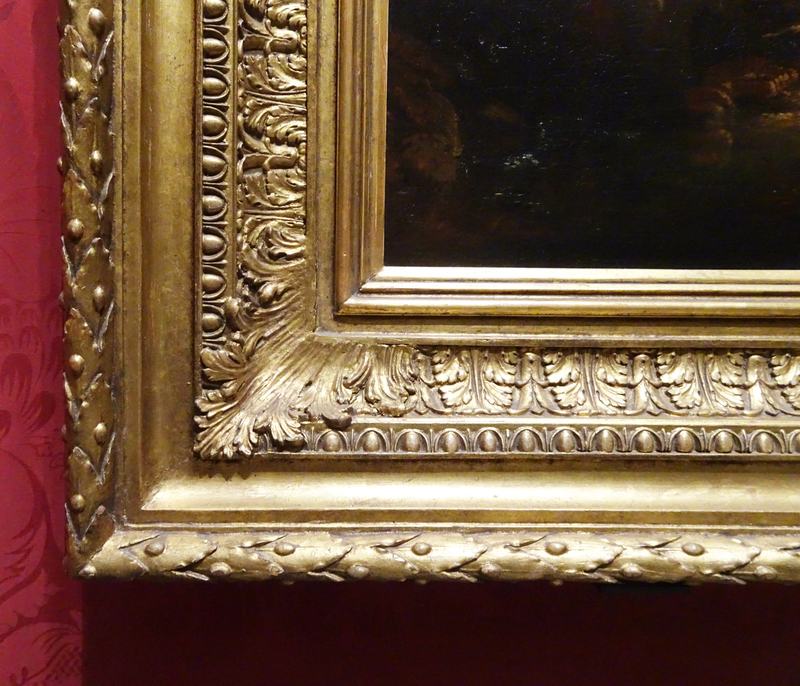 The authors describe this state as a ‘favoured condition’ , which is the desirable state for all paintings in the Bequest, but which has already been undermined for so many works by the movement and destruction of frames, or, where surviving, subsequent degradation or regilding. They illustrate an example – the original Rococo revival frame of The death of Actaeon, c.1837, which is currently in storage, ‘in poor condition with delamination, losses to the pine substrate and composition ornament, as well as flaking and losses to its dirty decorative surface’  – but which, it is hoped, can be restored and returned to the painting. 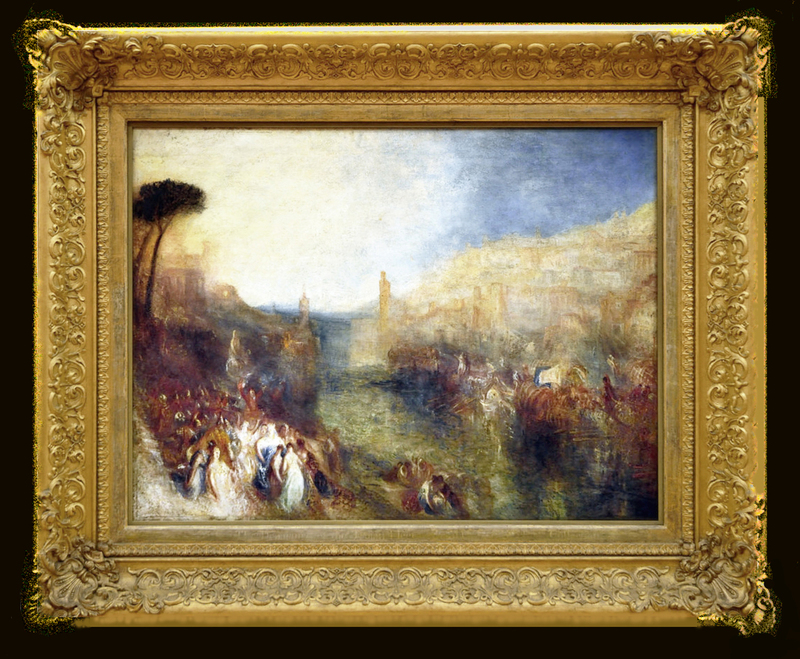 This has already happened to the revival Louis XIV style frame of The departure of the Trojan fleet, one of a series of four paintings on the subject of Aeneas’s visit to the court of Dido at Carthage, painted near the end of Turner’s life. One painting from the series had apparently been destroyed, and the others had been reframed in 20th century reproductions. 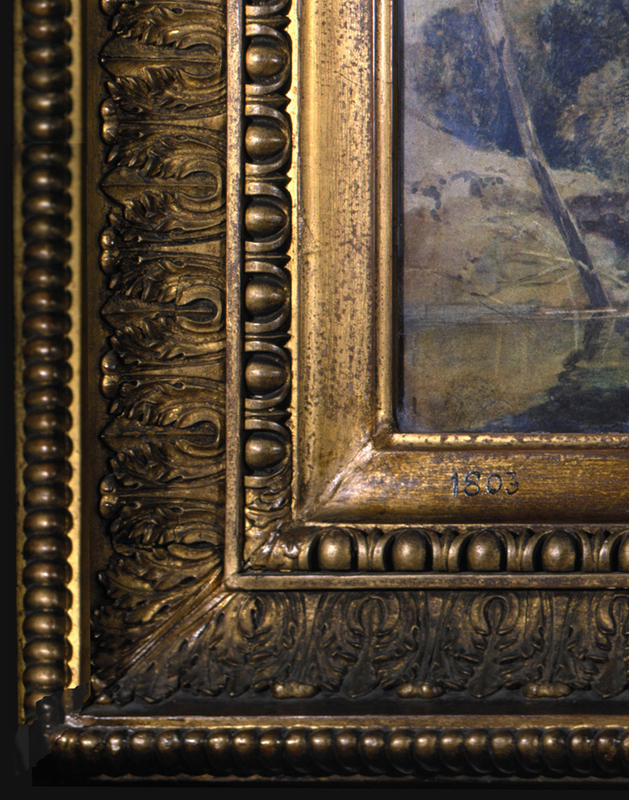 The frame above (re-used for a Turner sketch in 1944) was examined under ultraviolet light, when a painted-out inscription was revealed with the title, ‘The departure of the Trojan fleet’. ‘The necessity for re-treating frames in the future has produced the principle at Tate of predominantly using traditional materials and techniques, and it is envisaged that this approach will continue. Replicas are also made, as far as is possible, using original materials and techniques’ . 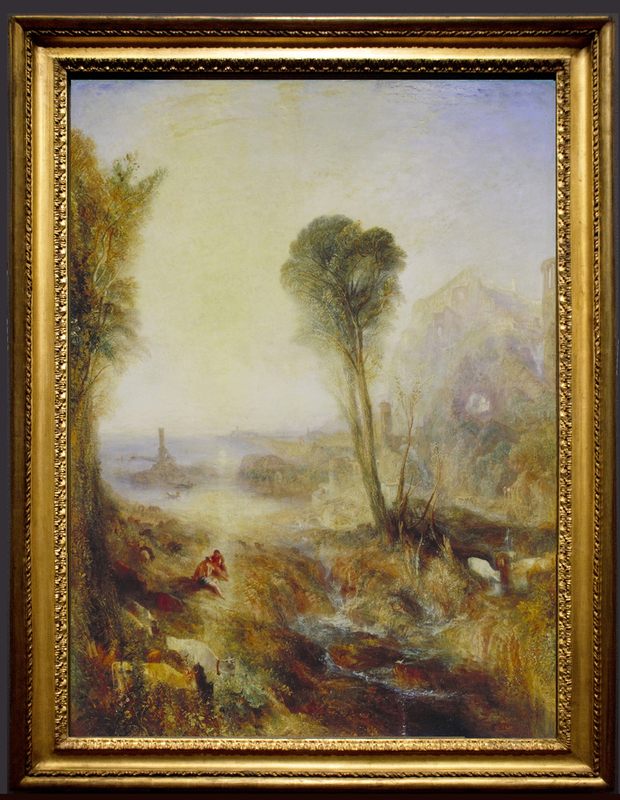 What may have appeared to be a rather pedestrian and accountant-like process of examining, cataloguing and entering on a database all the frames associated with the Turner Bequest has therefore resulted in an extremely creative and positive approach to their relationship with the paintings. 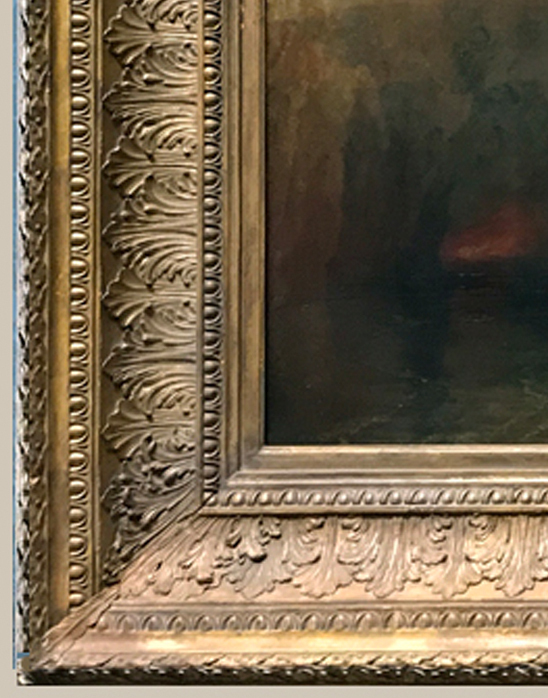 Original frames are being restored, re-united with the correct canvases, and copied where necessary, with the laudable purpose of returning as much of the Bequest as possible to an ideal version of what it was during the last years of its sojourn in Turner’s Gallery. Ivan Houghton, Catalogue raisonné of the frames for the oil paintings from the JMW Turner Bequest in the Tate and National Gallery Collections, Tate, 3rd edn, 4 vols, 2017. The Diary of Joseph Farington, ed. Kenneth Garlick & Angus Macintyre, 1979, vol.. VI, p. 2380. 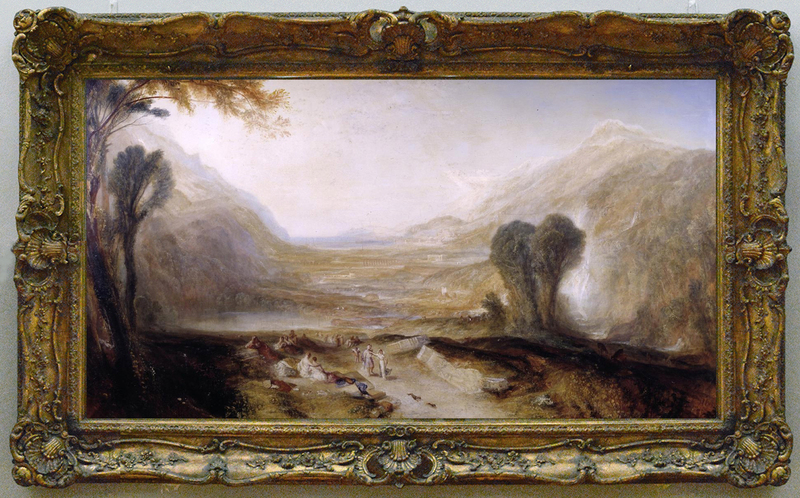 Childe Harold’s pilgrimage in a similar frame was exhibited in 1832 (Tate Gallery). See below; the original frame of The death of Actaeon is illustrated in the article in its storage wrappings; it is close in style and ornament to the frame of The story of Apollo & Daphne, illustrated here.